This scholarship celebrates a man who showed us it is easy to laugh at yourself, have fun and help others. Peter passed away in July of 2015 but he was a man who believed the best way to teach someone was to work alongside them and enjoyed sharing his knowledge and love for all growing things. A proud Husband, Father and Grandfather, Peter was a horticulturalist at heart; always stopping to pull a weed or unsheathing his secateurs to prune just one more branch. The love and passion for all things landscape led Peter to become a student in the first Horticulture Apprenticeship program at Humber College. Peter was the second generation owner of Royal City Nursery in Guelph and a teacher for 35 plus years. 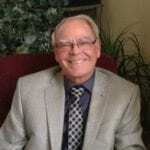 He was also a founding member of Landscape Ontario, a member of the Garden Centre Group Co-op, Chair of the Farm Safety Association and a Rotary Club member. The Olsen family set up this scholarship fund in Peter’s name to help budding Horticulturalists continue their education so they could in turn foster passion for planting and cultivation. To find out more about the fund or to donate click here: Peter Olsen Horticulture Apprenticeship Scholarship Fund, or contact Royal City Nursery at 519.824.4998.